Susanne Fullam has more than 18 years of human resources experience and has spent the last 14 years concentrating on law firm management. As Administrator, Susanne oversees the day-to-day operations of the firm, including managing Herrick's facilities, personnel and information systems. Susanne began her career at the prestigious investment banking firm Oppenheimer and Company as a personnel recruiter and employee relations specialist. 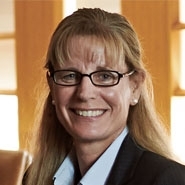 Her first stint in a law firm came in 1989 when she joined Webster & Sheffield, a large international law firm, as the firm's personnel manager. Later, Susanne joined Christy & Viener as Personnel Manager, and in 1994 joined Herrick as our first-ever personnel professional. During her five years as Personnel Manager at Herrick, Susanne established firm policy and procedures, handled all employment and employee relations issues, and designed and implemented the firm's health and welfare plans. Susanne was also responsible for the hiring of all of Herrick's non-legal personnel. Since becoming Director of Administration, Susanne concentrates her efforts on the overall management of Herrick's three offices and 215 partners and employees. Susanne is a member of the Association of Legal Administrators and serves as a peer consultant for law firm administration issues.